People in general regard food as their major concern. For the Tujia people, their daily diet mostly consists of: rice, millet, corn, white potatoes, sweet potatoes, and various mixtures of these. They prepare their meals in a variety of cooking containers: pots, steamers, and bamboo cookers. 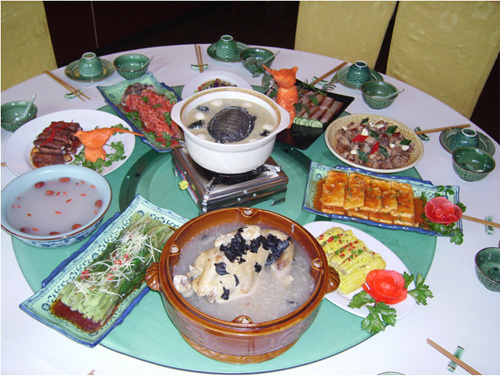 Food for Tujia people is such a complicated matter, and their dishes are even more artistic. 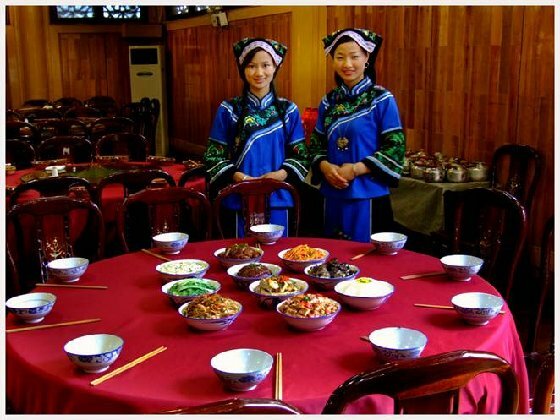 They differ from the hot and spicy <?xml:namespace prefix = st1 />Sichuan cuisine and the salty and spicy Guizhou dishes; the Tujia people prefer a combination of sour and spicy. 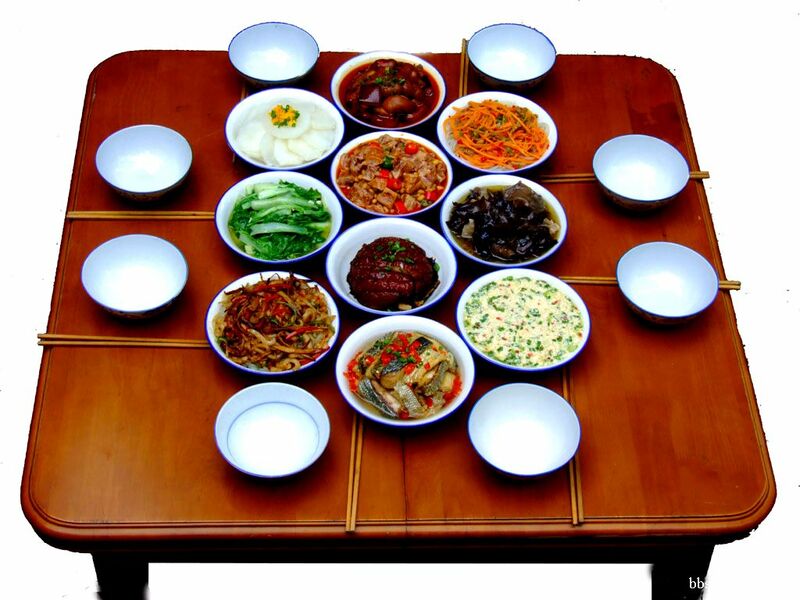 Their favorite dishes are to your surprise, spicy-pickled vegetables-pickled carrots, pickled cabbage, pickled beans and pickled peppers. They even prepare pickled meat and fish. The sour flavor and spicy taste in the Tujia cuisine can fully satisfy your appetite, and at the conclusion of the meal, you are unable to discern whether the dishes were sour or spicy-just as the joys and sorrows of life are blended into one. 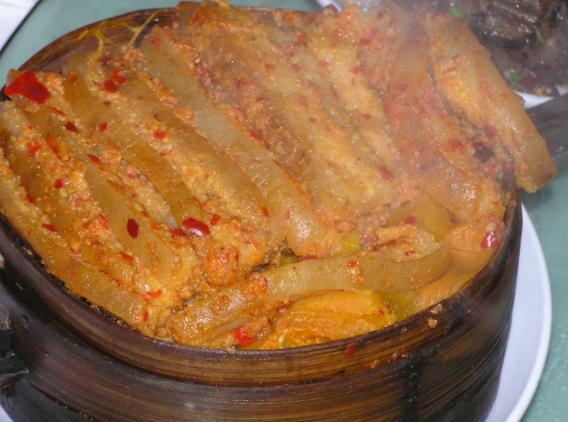 Pickled dishes usually just serve as garnishes for the Tujia meals, but cured meal is the staple of Tujia cuisine and also the most delicious. There are a wide variety of cured meats: pork, chicken, duck, fish, as well as others. In fact, almost all-edible flesh can be prepared in this way. Among them, cured pork is the most popular one. 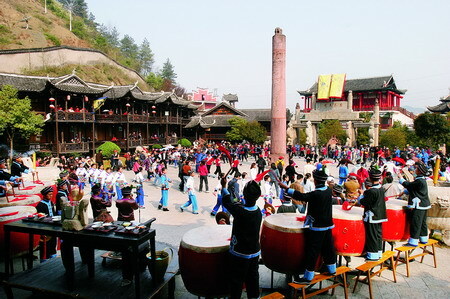 Formerly the basis of the Tujia self-sufficient but backward economy was the feeding of chickens and the exchanging of eggs for salt; also it involved the raising of pigs for celebrating the new year, and the slaughtering of the animals and curing of the meat. Nowadays, things are different: many Tujia villages close to or above the living standard of Xiaokang (a relatively comfortable one) still follow the custom of killing pigs for the new year; however, they are raising larger pigs and putting more emphasis on the production of cured pork. It has even become a cultural phenomenon; for some enterprising Tujias have begun to export tujia-cured pork. Usually the pigs are slaughtered at about the time of the winter solstice (November 232nd or 23rd), and the meat is cut into pieces weighing between 2 and 4 kilograms. Salt, Chinese prickly ash, pepper and other spices are rubbed into the pork, which is then saturated into a large container for ten to fifteen days. At the end of this time, the pork is hung over a fire pit, and when the surface of the meat is sufficiently dehydrated, the preparers begin the smoking process. And there is a definite art to this: instead of using dry wood, it is best to use a mixture of pine branches, sawdust, rice husk and charcoal to stoke the fire. Besides this technique, if some dry orange peels are added to the flame, the heat is maintained at a steady, moderate rate; then, the pork turns golden-brown and, after half a month, is truly succulent. When the cured pork is further dried, the Tujia people usually bury it between layers of dry rice stalks or preserve it in their rice bins. For many affluent families, the cured pork can suffice for an entire year. Cooking the cured pork is also a culinary art. 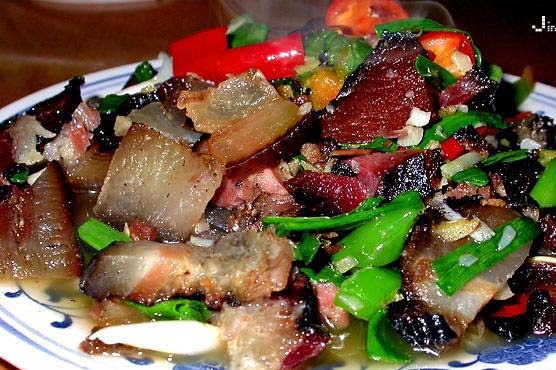 Whether the Tujia people fry the meat with garlic, steam it with sticky rice, roast it with green pepper, or stew it with fermented bean, the cured pork will be pleasing to the eyes and very satisfying to the palate. This is especially true in the spring festival and at other traditional holidays when many relatives and friends congregate. Enjoying a hot pot of succulent cured pork naturally makes everyone feel more intimate and festive.